Every year, thousands of students read the popular book, Freedom Crossing, by Margaret Goff Clark (1913-2003). The story involves the Underground Railroad which was a secret network of trails and homes that helped slaves from the Southern United States escape to Canada in the early to mid-1800s. The story takes place in Lewiston, New York, which was the final stop for escaping slaves from the South. Once they reached Lewiston, they only had to take a boat ride across the Niagara River to Canada, and freedom! But it wasn’t easy. There were slave catchers and bounty hunters who were hired to capture the slaves and take them back to the South. It was very treacherous for the slaves and the volunteer citizens who helped them. Lewiston’s citizens hated slavery and many of them volunteered to help smuggle thousands of slaves across the border. There was a code of silence and the people of Lewiston never trusted or spoke to outsiders about their secret activities. It is estimated that thousands of slaves were smuggled through Lewiston and made their way to the Canadian shore and freedom. The story happened in Lewiston, New York. Where is Lewiston located? Lewiston is a real town and is located 7 miles north of Niagara Falls, New York. It is situated on the Niagara River, across the river from Canada. The river is about 1500 feet wide. Actually, the world famous Niagara Falls started in Lewiston 12,000 years and has eroded south 7 miles since then. So when you look at the Niagara River from Lewiston, you are really looking at water that has already gone over Niagara Falls and is flowing north to Lake Ontario and eventually to the Atlantic Ocean. Today, about 3000 people live in the Village of Lewiston, and 16,000 people live in the Town of Lewiston which surrounds the Village. Was there really a place called Tryon’s Folly? Yes! And it is still there. The Freedom Crossing book called it the House with 4 Cellars. Some call it the House of the 7 Cellars. It’s all in how you look at the configuration of the multi-leveled home. It was built on Lower River Road in 1830 by Amos Tryon (1791-1874), Josiah’s older brother. The original home was to have housed a business and a new homestead for Amos’ wife Sally Barton, who was Benjamin Barton’s (a prominent citizen) daughter. However, Sally refused to move from their existing home on 4th and Center Street. So, it was called Tryon’s Folly after that. But when Josiah figured out that the house was an ideal spot to hide and smuggle slaves, the house was put to use. You can see some pictures on this webpage of what the inside of the basements look like today. Tryon’s Folly has a multi-leveled interconnecting basement, containing several separate rooms, that could easily hide slaves. The original home had a fire in 1900 and a new structure was built on old foundations in 1915. It is a private residence today and not publicly accessible, so these rare pictures, taken in August 2005, are the closest you will get to see what it is really like. Was Laura a real person? Was Martin a real person? No, they were not real people, but they could have been. Everything Laura and Martin did in the book could have really happened. The author made them up as pretend characters to help readers understand how the slaves were hidden, how slave catchers tried to catch them, and how local citizens, like Laura, helped the slaves escape to freedom across the river in Canada. So everything you read in the book was very close to being the real thing. Dozens of people helped the slaves escape, but since the whole thing was a secret there was nothing recorded in books or on paper that provided names of the people involved. However, we do know that Josiah Tryon was very active. 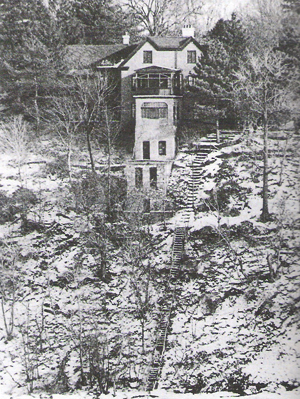 This is an old picture of Tryon’s Folly taken in the winter time. (Pictures taken in the summer don’t show much because the trees and bushes cover it up.) 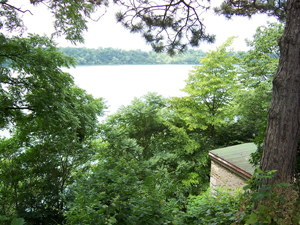 This picture was taken from the Niagara River and shows the back of the house. You can see the different levels of the basements. The basements could have been easily disguised as place to do business for Amos and Josiah Tryon because it was close to the river and they could have transported goods back and forth from the river. But in reality, it was place to hide and help escaping slaves get to Canada and freedom. (left) Here is a passageway inside the basement complex of Tryon’s Folly. At the end is a window where slaves could look out and see Canada. (center) Here is a secret stairway inside Tryon’s Folly that would have taken slaves from one level of the basement to a lower level of next basement. 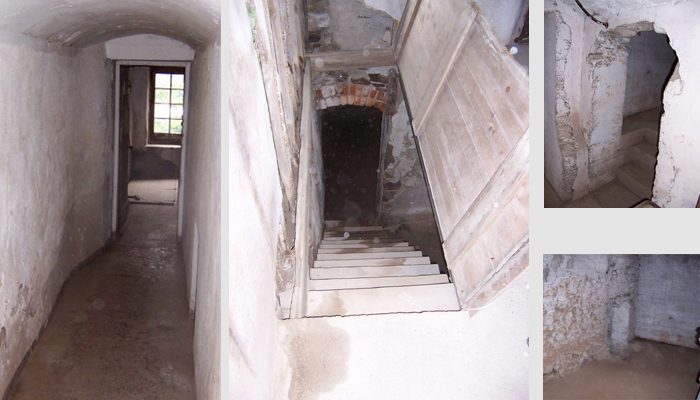 (above at top right) Here is an entrance to a secret room within the basement complex. When covered, it would be very hard to see the opening because of the way it was positioned. (above at bottom right) Here is view of the entrance from inside the secret room. It is a dirt floor and is large enough to have hidden up to 30 slaves easily. It would have been difficult to find them if the opening was covered with regular supplies, like wooden beams, or sacks of food. 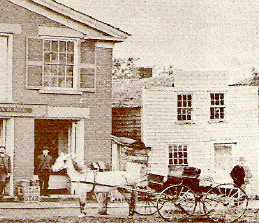 Here is an old picture of Josiah Tryon’s Tailor Shop next to 441 Center Street Lewiston. It is the small building on the right. It is no longer standing and there is no record of when it was built or what became of it. (The place were his shop was is now a parking lot for a popular restaurant.) Josiah actually made friends with the slave catchers and made them jackets as gifts. But it was a trick. The slave catchers did not know that by accepting Josiah’s jackets, which were made of bright colors, that everyone in town could identify them. When the people of Lewiston saw someone in a bright jacket, they knew NOT to talk to him about the Underground Railroad. That’s why the slave catchers had a difficult time getting information from the local citizens about where the slaves were hiding. None of the local citizens ever betrayed the code of silence in the Town and everyone kept the slaves hidden and safe until they left for Canada. 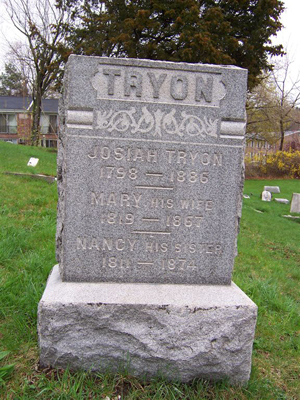 Josiah Tryon is buried in the Village of Lewiston Cemetery next to the Presbyterian Church at Cayuga and S. 5th Streets. This is his gravestone. He lived to see the day when the slaves were freed in the South. Laura Eastman’s home was on Ridge Road. Is that really a place? Yes, there really is a Ridge Road, known as Route 104. However, it not clear if the author of the book had a particular house in mind. Many of the old homes on Ridge Road that are still standing, could have been ideal hideaways for the slaves. So the story has some basis of truth. Josiah Tryon was mentioned in the book Freedom Crossing. Was he a real person? Yes, Josiah (pronounced Joe-si-ah) Tryon, Jr., was a real person and he was the secret volunteer “station master” for Lewiston’s part in the Underground Railroad. He was born in Weathersfield, Connecticut, in 1798 and lived until 1886. He moved to Lewiston with his wife, Mary, in 1835. He was a tailor in Lewiston and he and his fellow citizens hid and guided slaves to freedom in Canada. Since this was all done in secret, very little is written about their activities. However, Josiah and other citizens took hundreds, probably thousands, of slaves across the river to Canada in row boats in the middle of the night. But even before they got to the river, the slaves were hidden in area homes, like Laura hid Martin in her home in the book Freedom Crossing. Was there really a Presbyterian Church that was a hiding place for slaves? Yes, and the church is still there. It is located at 5th and Cayuga Street. Another local church was also used to hide slaves and that was the Episcopal Church at 469 Plain Street, which is now the home of the Historical Association’s Lewiston Museum. It’s just a short distance from the Presbyterian Church. 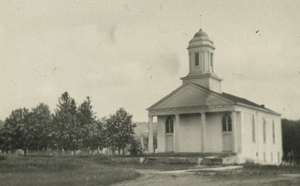 Here is an old picture taken in the late 1800s or early 1900s of the Presbyterian Church in Lewiston, where many slaves were hidden. The church is still standing and it is still owned by the Presbyterians. In the story, Freedom Crossing, the Presbyterian Church is the place were Laura and her brother first noticed their carriage had been stolen when they saw it being used to take a slave away. Local residents referred to the slaves as “strangers” so as to not reveal their identity and keep them safe.Here is an old picture taken in the late 1800s or early 1900s of the Presbyterian Church in Lewiston, where many slaves were hidden. The church is still standing and it is still owned by the Presbyterians. In the story, Freedom Crossing, the Presbyterian Church is the place were Laura and her brother first noticed their carriage had been stolen when they saw it being used to take a slave away. Local residents referred to the slaves as “strangers” so as to not reveal their identity and keep them safe. Why do they call it the Underground Railroad? They called it the Underground Railroad, even though it wasn’t a railroad. The “trains” were the large farm wagons that could conceal and carry a number of slaves. The “tracks” were the back county roads which were used to evade the slave catchers. The “stations” were the homes and churches where the slaves were fed and cared for as they moved along. The “conductors” were the fearless men and women of both races who led the slaves toward freedom, and the “passengers” or “parcels” were the slaves who dared to break for liberty. 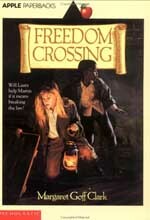 Is Lewiston doing anything to commemorate the Freedom Crossing book?